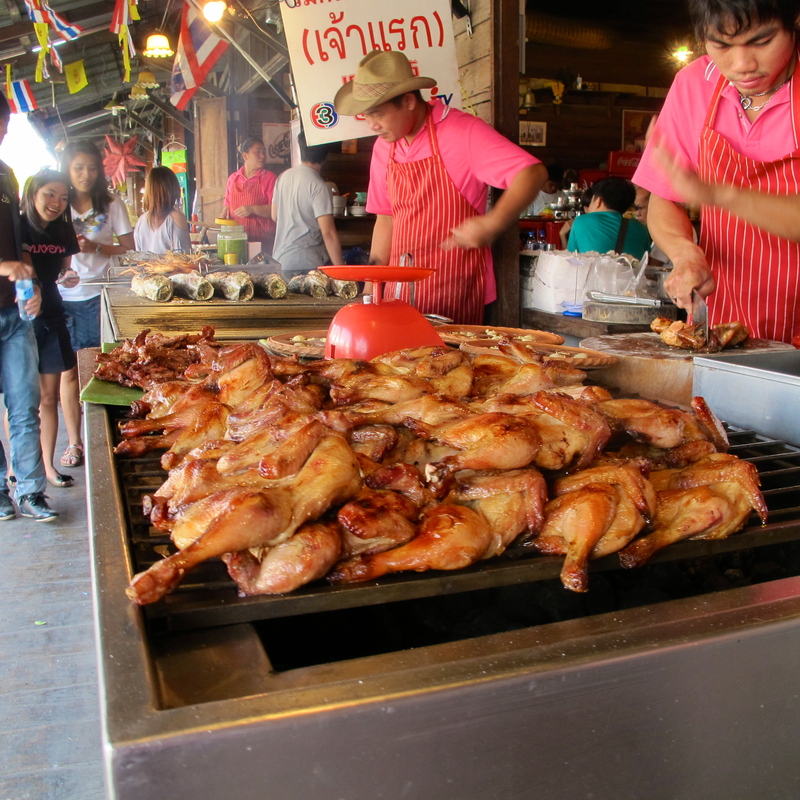 Grilled Thai Chicken Gai Yang, shown here from my visit in 2011, is famous Thai street food. On May 29th—just about two weeks ago—The New York Times published the article “Cuisines Mastered as Acquired Tastes.” It told the story of some cooks that have become stars of authentic cuisines from other than their native countries. One person mentioned in the article is Superstar Thai chef, Andy Ricker, the James Beard Best Chef in the Pacific Northwest in 2011. The article was fascinating reading and brought to mind my last week’s post on Thai basic seasoning paste. Andy Ricker uses Kratiem Prik Thai paste – a basic Thai seasoning – in his restaurant kitchens as intensively as a Thai would in his. I have been to Andy’s Pok Pok Restaurant in Portland, Oregon a few times. Several of the dishes on his current menu obviously use this basic Thai seasoning paste, including Kai Yaang: Charcoal, rotisserie-roasted natural game hen stuffed with lemongrass, garlic, pepper and cilantro), Moo Paa Kham Waan (Boar collar meat rubbed with garlic, coriander root and black pepper glazed with soy and sugar grilled over charcoal) and Kung Op Wun Sen (Wild caught gulf prawns baked in a clay pot over charcoal with pork belly, soy, ginger, cilantro root, black pepper, chinese celery and bean thread noodle.). Andy uses Kratiem Prik Thai as a marinade sauce in the first two dishes and as a seasoning in the third. Goong Oob Woon Sen, a famous Thai hot pot dish served on a banana leaf. I enjoyed this dish served from a clay pot or on a banana leaf by street vendors in Amphawa. 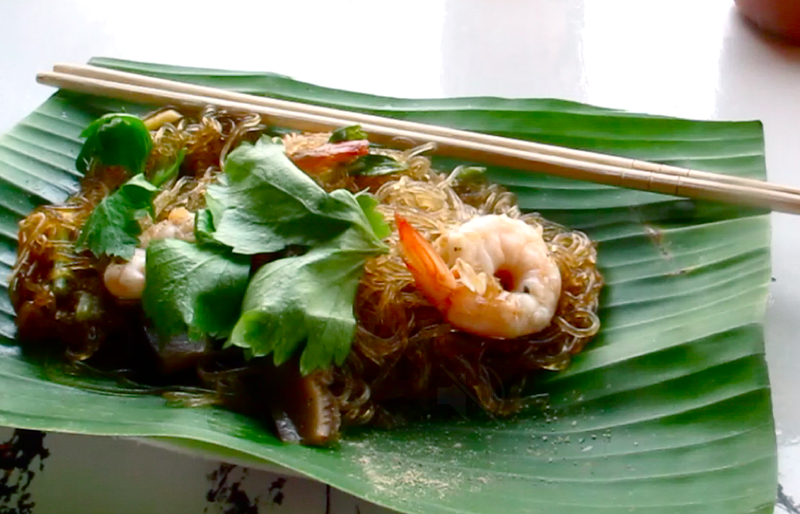 The grass noodles were soaked with the delightful flavors of soy, cilantro root, garlic and black pepper. A short gentle braising brings out all the great flavors. It is great to see non-Thai become super stars in Thai cuisine because it is important to educate both Thai and non-Thai about our truly amazing cuisine. We would like non-Thai to appreciate and learn about authentic Thai cuisine in restaurants in America and elsewhere. And most importantly, we would like for Thai restaurant owners to work hard to preserve our culinary heritage through menus that don’t just offer dishes laden with sugar and coconut milk. If you are looking for a Thai cookbook, here are some authorities on Thai cuisine whose work I admire: David Thompson, a restauranteur and cookbook author; Nancie McDermott, cookbook author and historian; Robert Carmack and Robert Danhi, cookbook authors and tour leaders to Southeast Asia; and Naomi Duguid and Jeffrey Alford, cookbook authors, writers, travelers and photographers. My friend Kratiem Prik Thai Pla at Kamala Beach village Pavilion Beach Restaurant with its signature garlic-black pepper sauce, topped with a lot of fried garlic. 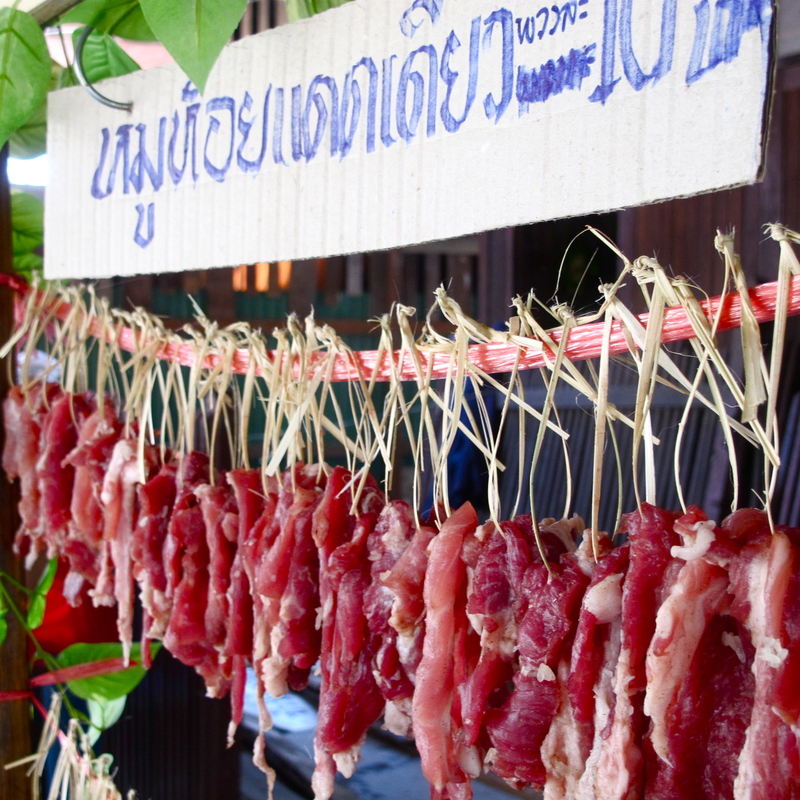 Now that you have learned about Kratiem Prik Thai paste from this and the previous post, you can have fun learning to be a food detective, reading menus and finding the tastes of garlic, black pepper, and cilantro toots in Thai restaurants. Cilantro roots alternative. In Seattle, when I see cilantro roots at a farmers market or at PCC Natural Markets, I buy a bunch so I can have a supply on hand in the fridge and the freezer. When cilantro roots are not available, I use 2 teaspoons of finely chopped cilantro stems as a substitute for 1 cilantro root. 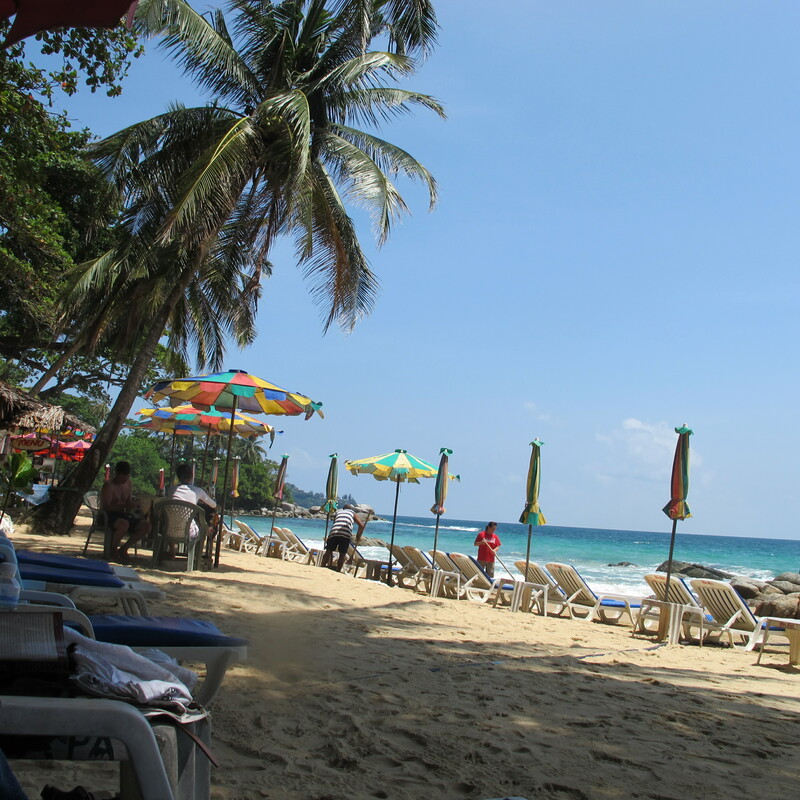 I hope you enjoy my photos from a famous restaurant in Bangkok, street food in Amphawa, and a beach restaurant in Phuket. The creators of these dishes may vary as to their preferences for white pepper or black pepper, soy sauce or fish sauce, palm sugar or white sugar, but they all use the secret ingredients of garlic, black pepper and cilantro root. Please let me know if you have any suggestions for using Thai Basic Seasoning Paste Recipe. Sun-dried pork on the street at Amphawa, ready to deep fry to order. 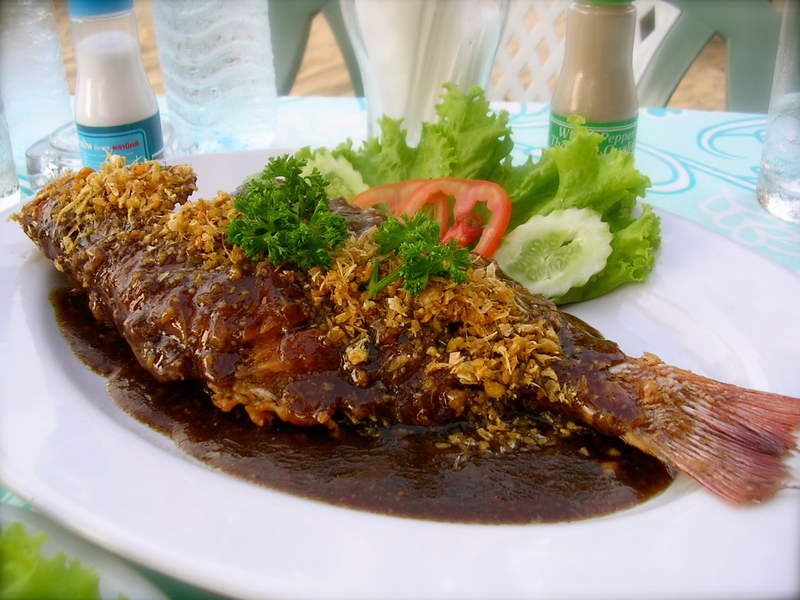 Some Thai cooks prefer to use fish sauce rather than soy sauce and white peppercorn powder rather than black pepper corns in making Kratiem Prik Thai Rak Puk Chee paste. 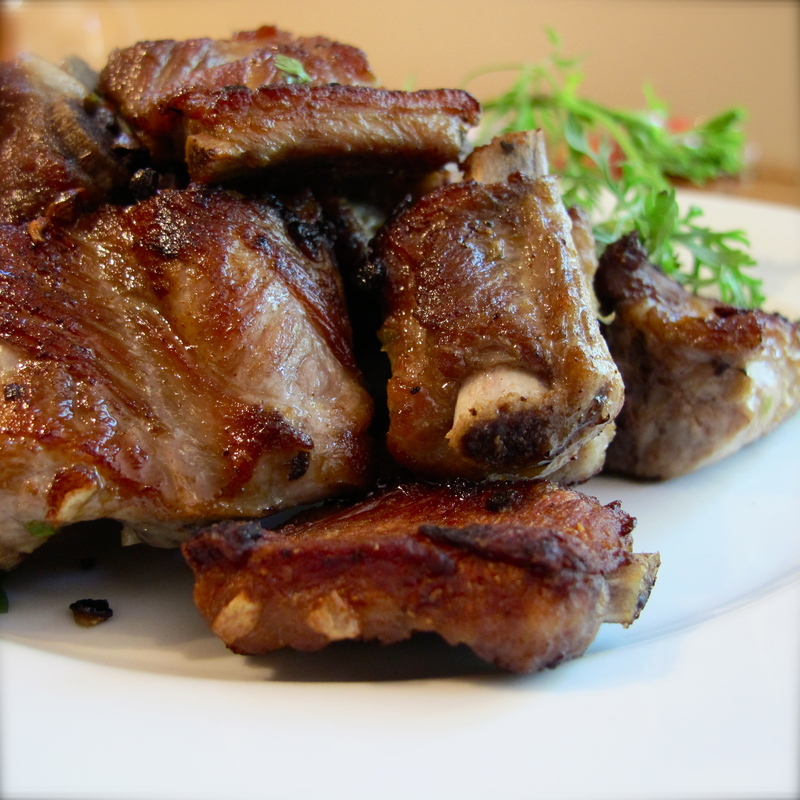 Kradook Moo Yang – grilled pork ribs – after marinading in basic Kratiem Prik Thai paste. 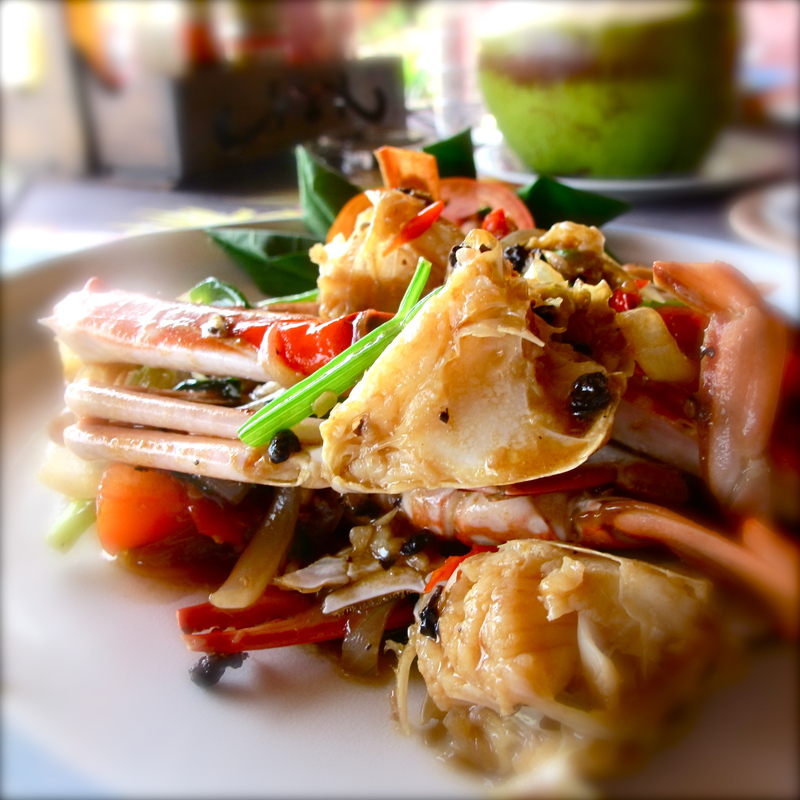 You will find the nationally famous garlic prawns in many forms and under many names in Thai restaurant menus. The traditional Thai version doesn’t mix in vegetables but has a few fresh sliced cucumbers on the side. 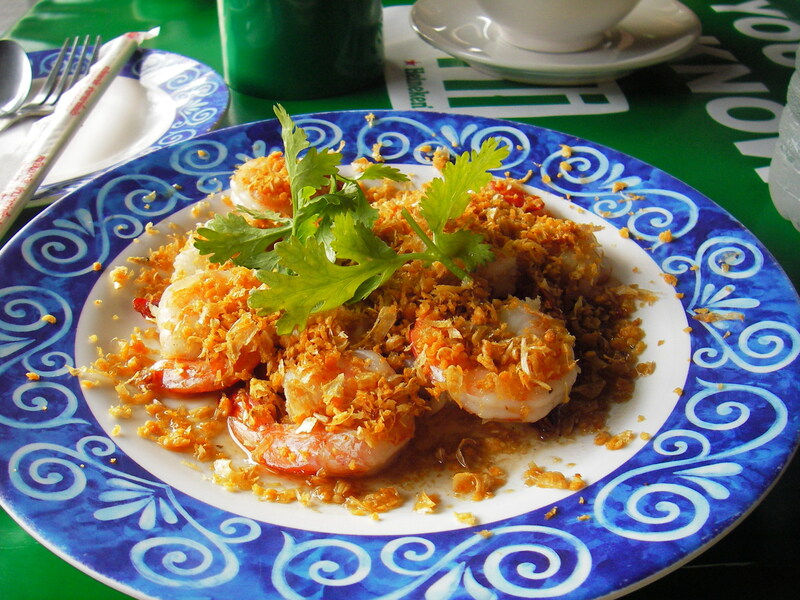 This photo of garlic prawns was taken at Harmonique Restaurant, my favorite restaurant in Bangkok. First of all, Happy New Year – Sawasdee Pee Mai – สวัสดีปีใหม่. I have just returned from a family vacation to Maui. 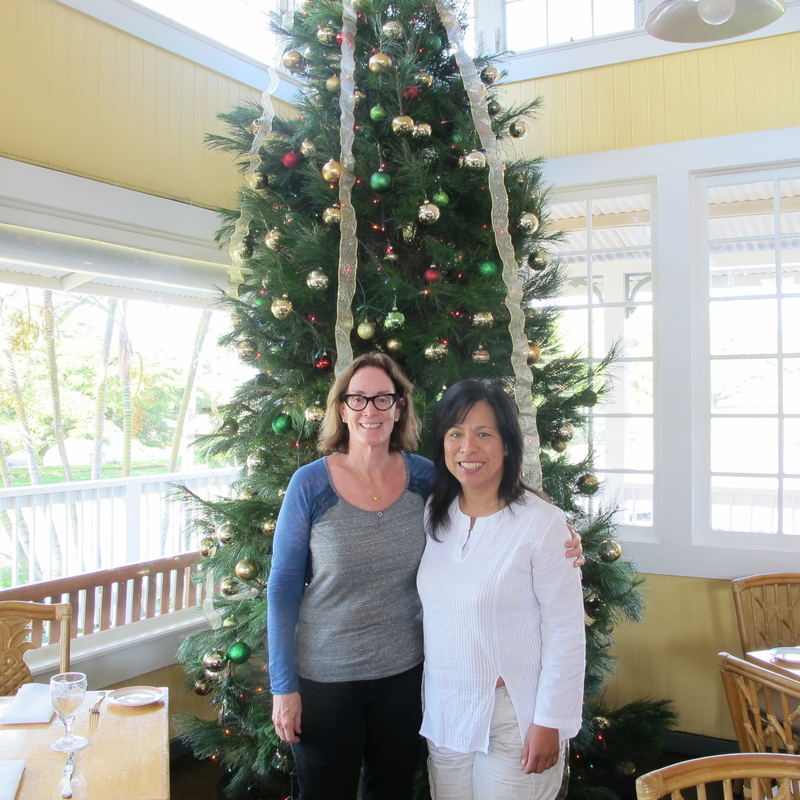 While I was there I had the chance to take two days off to totally explore Maui as a culinary getaway. 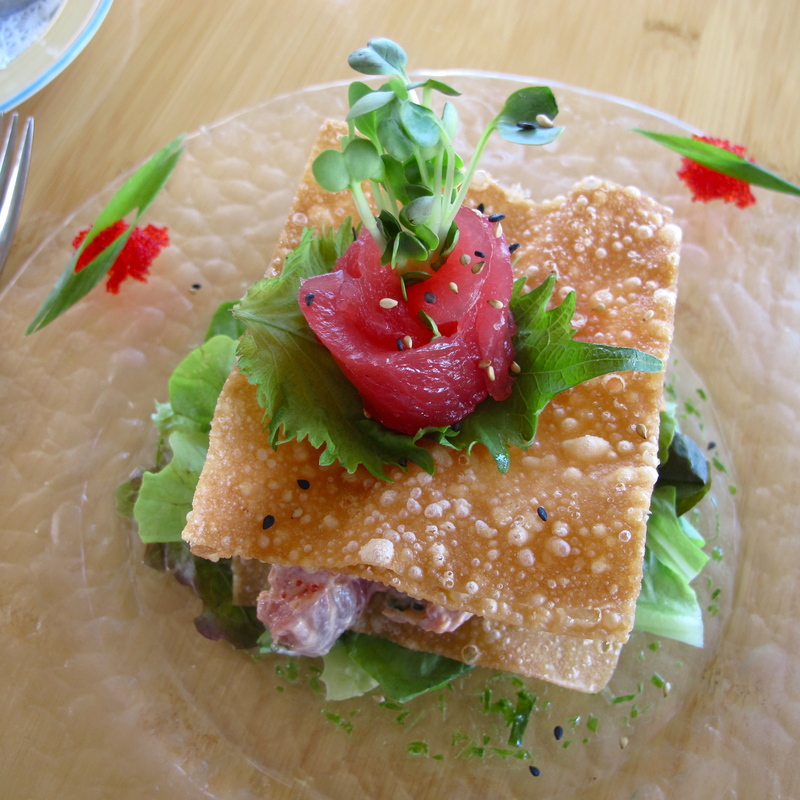 For foodies and culinary enthusiasts, the upcountry is a must. 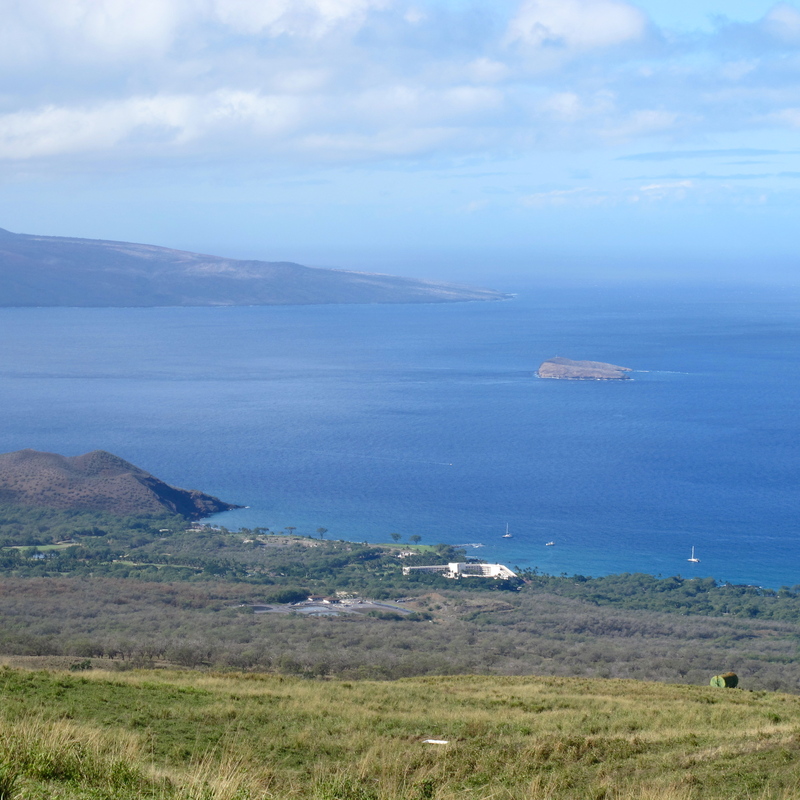 No Maui vacation is complete without a full immersion into this land, people, food and culture. 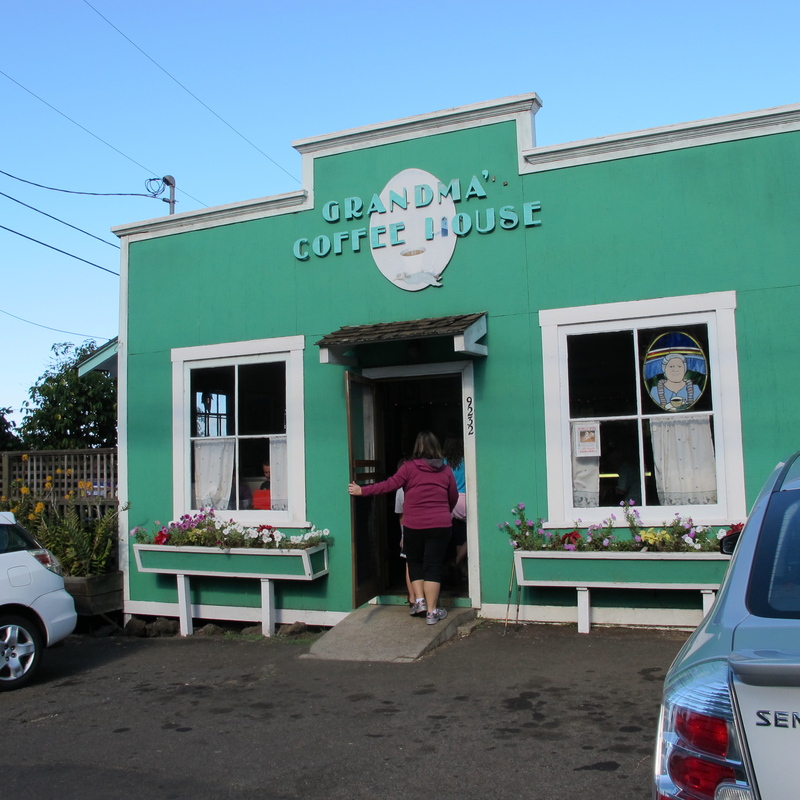 I arrived at 9:30am at Grandma’s Coffee House – a must-visit place for coffee lovers, either on your way to the Maui Winery or afterwards if you are following the area’s bike route. Grandma’s serves breakfast and lunch. Grandma’s Maui Coffee, Highway 37, Keokea. I enjoyed a Grandma’s Americano and a Grandma’s Pineapple and Banana Cream Cake at an outside table. The cake was perfect—not too sweet, but with all the Hawai’i goodies: macadamia nuts, pineapple and bananas. The frosting was light with a swirl of caramel. My palate tasted the heaven. Around 10am I got back in the car and, continuing on Highway 37, headed to Ulupalakua. I arrived at the Maui Winery 20 minutes later, just in time for the first tour at 10:30am. The free half-hour tour provided extensive information about the winery and its wine, as well as the history, culture, and native land that connect to the spirit of the place. The old large tree and hilly landscape made for a very tranquil atmosphere. 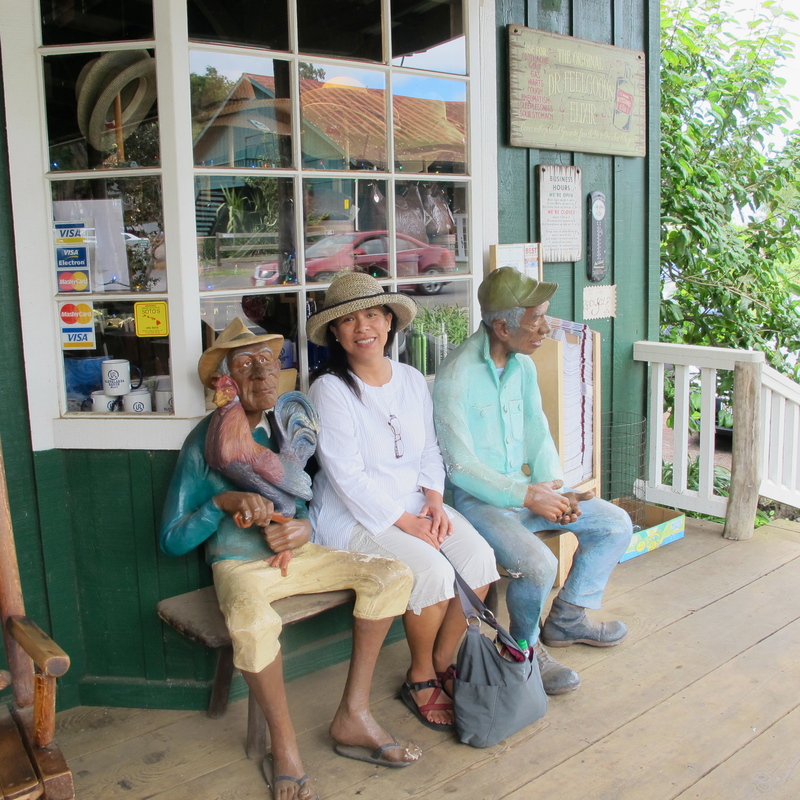 Then I walked to Ulupalakua General Store and had my picture taken between the sculptures of two Hawaiian cowboys. 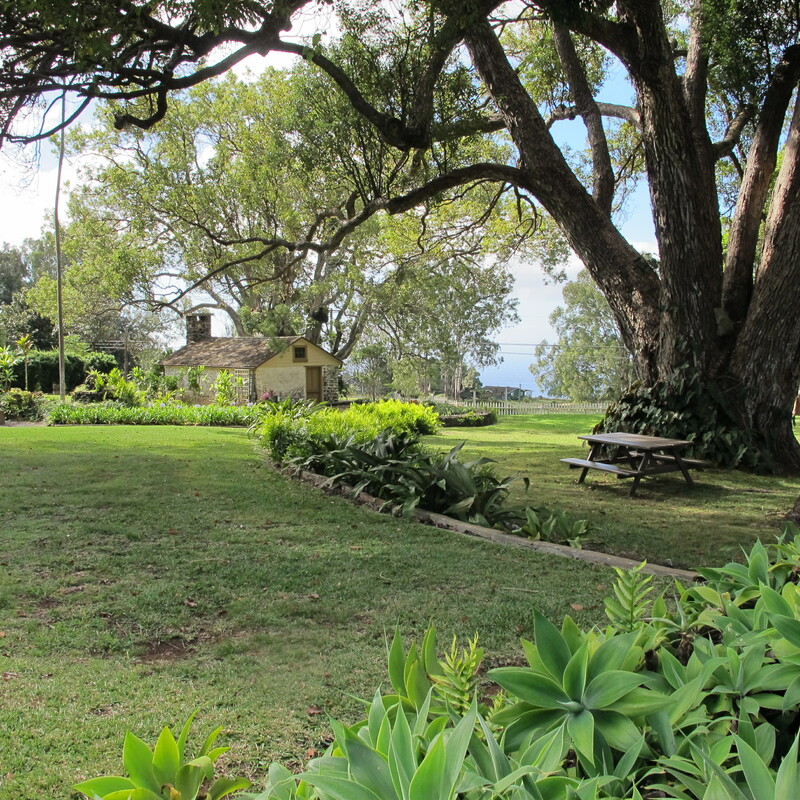 I could have ordered an elk burger, salad or sandwich for lunch, but the Ali’i Kula lavender Farm was my next destination and I planned to have a late lunch after that at the Hili’imaile General Store. Ali’i Kula Lavender Farm, 1100 Waipoli Road, Kula. 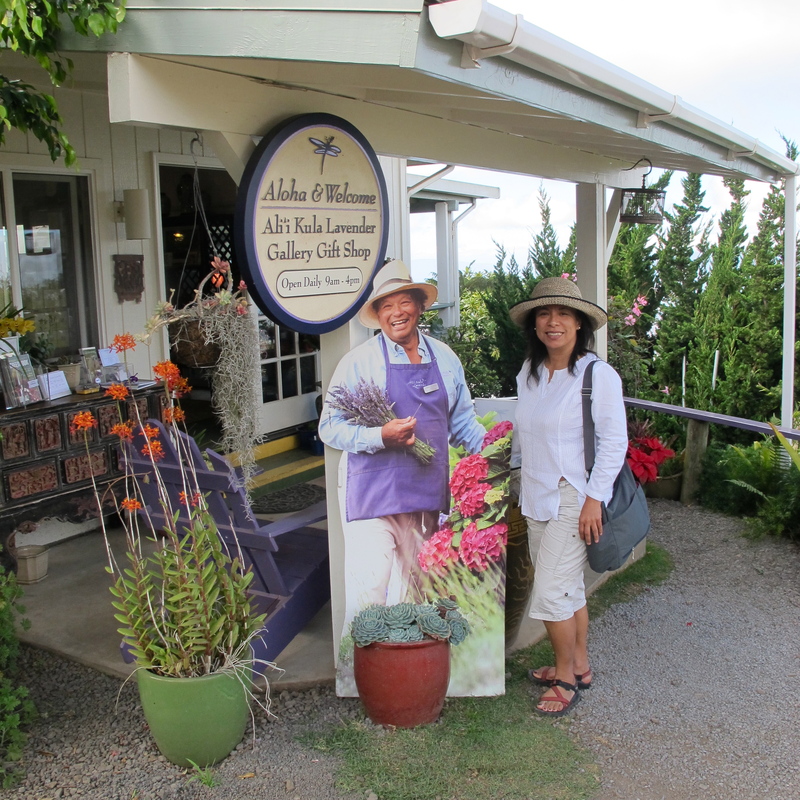 Twenty minutes later, I arrived at Ali’i Kula Lavender Farm. Admission to the farm was free, but I decided to take the 30-minutes tour at 1pm for $12. This gave me plenty of time to enjoy the gift shop, eat a lavender scone and sip some lavender black tea on the patio. I enjoyed the retreat-like setting in the beautiful garden with its cool air and great view and felt at peace. Thank you to Kathy Gehrt, my friend and author of the cookbook Discover Cooking with Lavender, who recommended this place to me. If you wish to learn more about cooking with culinary lavender please visit Kathy’s blog: Discover Lavender. Right after the tour ended, I excused myself and headed out to The Hili’imaile General Store. I arrived at 2 pm, just 30 minutes before the kitchen was to close. The staff was very friendly and I took their recommendations for what to order. I was glad I did. 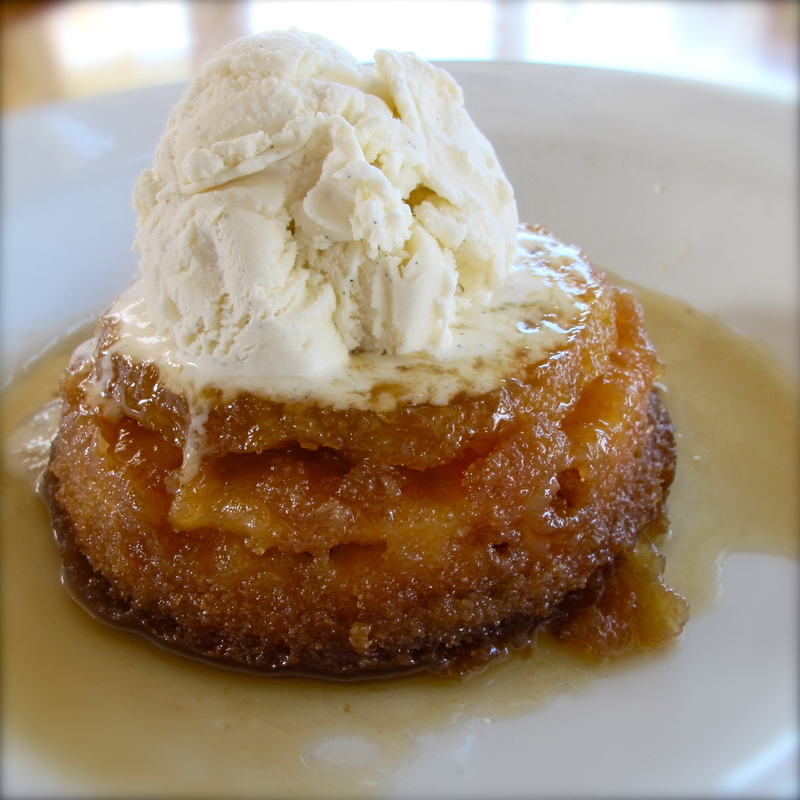 To share my memorable meal with you, I have found Chef Beverly Gannon’s recipes online and placed the links to them right under the pictures of these dishes. The Sashimi Napolean and the six times award-winning Pineapple Upside-Down Cake are not to be missed. The recipes are also in her second cookbook, Family-Style Meals at the Hali’imaile General Store which is published by Ten Speed Press. On Monday, December 26th, the second day of my upcountry culinary getaway, I started my day with breakfast at Kula Lodge, then drove to the O’o Farm which is only 10 minutes away. I arrived at the farm just 10 minutes before a farm tour was to begin. 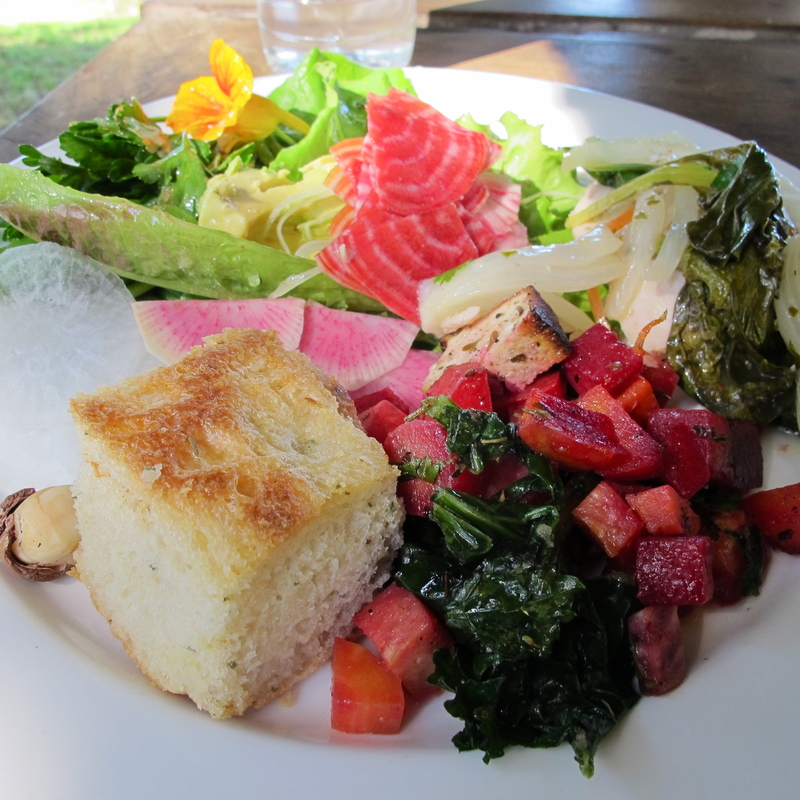 Chef Caroline Schaub prepared some amazing and inspired farm-fresh dishes. 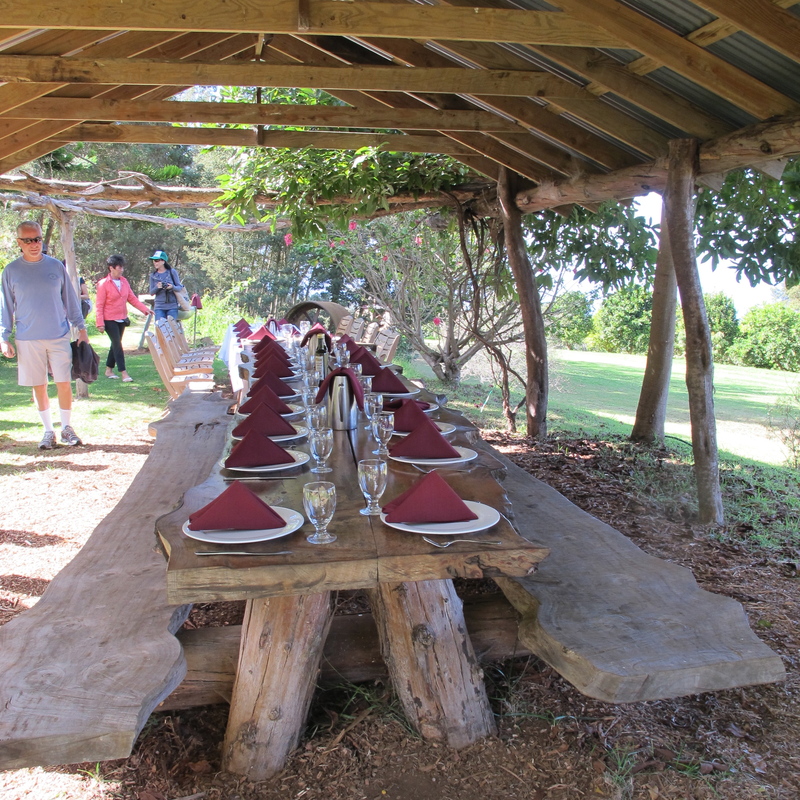 The farm tour and lunch package costs $50; booking in advance is recommended. 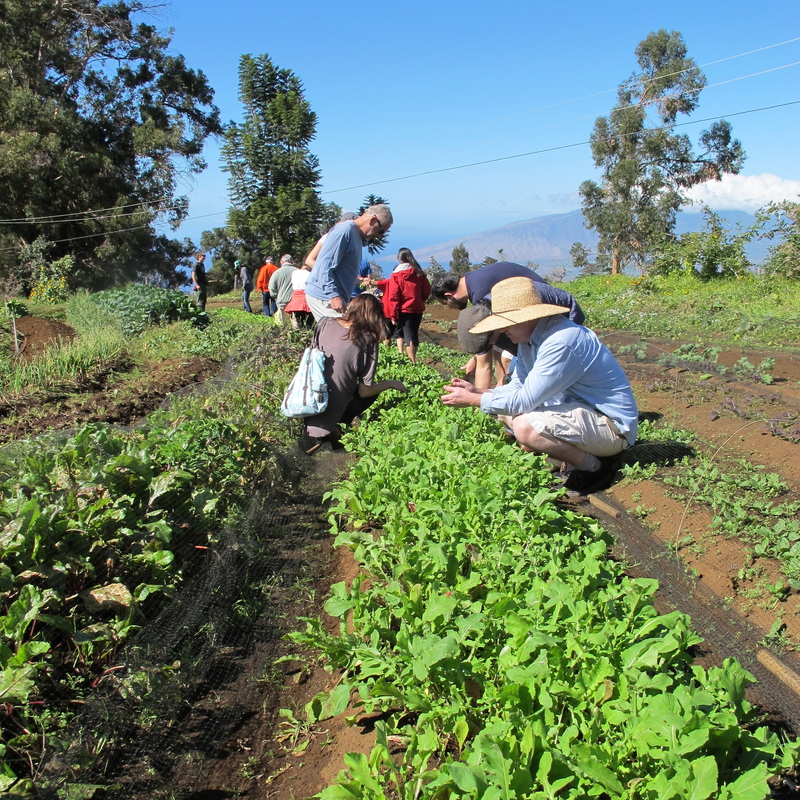 The tour, which included about 26 people from all across the United States, was guided by the farm manager. It started at 10:30am and we picked our own salad mix at the end. 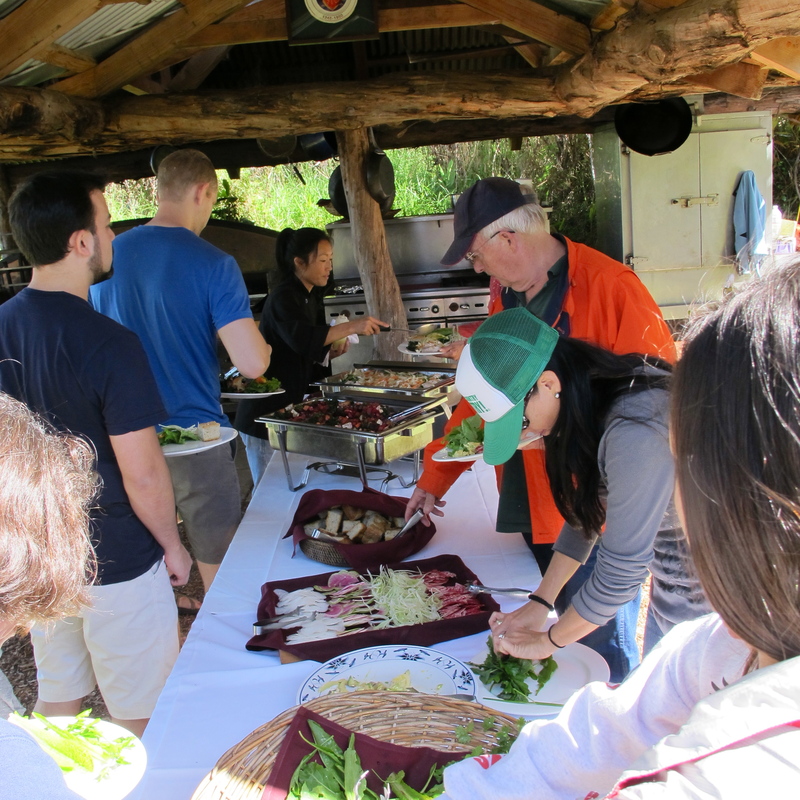 We all enjoyed the tour and were inspired by our farm-to-table experience. 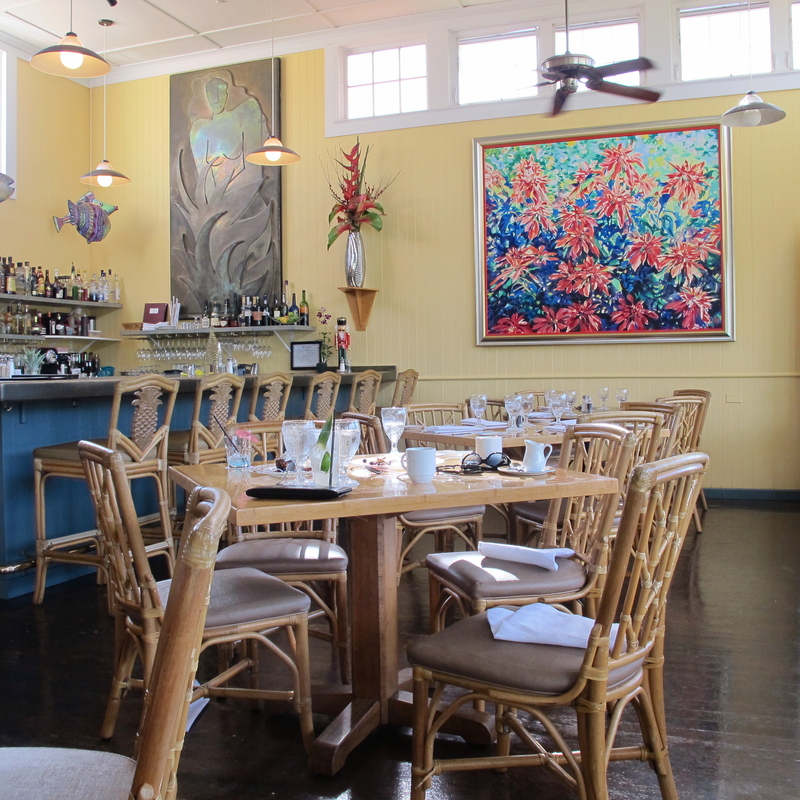 After leaving the farm I spent a pleasant hour in Makawao, a delightful small town for visiting art galleries, eateries and shops. Then I made a leisurely drive back to Ka’anapali and met up with my family in the late afternoon. I have finally found my place to have oodles of noodles. And I have to thank to my friend Ron who introduced me to his favorite restaurant: Hue Ky Mi Gia, a Chinese Noodle House in in the Seattle International District’s Little Saigon. My first visit with Ron was in October 2010, then we went again in November to explore more noodle dishes right after the restaurant celebrated their first anniversary. Each visit we enjoyed the personal touch of a friendly conversation with the owners. That’s how we learned that they are now planning to open a new restaurant soon in another location. I loved my first bowl of noodles there and knew that all of their dishes would be good. After a few visits and many oodles of noodles, I am sure that noodle fans will appreciate this review. The noodle dishes at Hue Ky Mi Gia are simply delicious and satisfying. The flavors are authentic and provide the same tastes that one could savor while traveling in Southeast Asia. The dishes are not prepared to Americans tastes, but according to Asian soup traditions, from preparing the broth to using real ingredients in each dish that truly represent the original dish. Tiu, the owner, told us that most dishes on the menu are prepared here the same way that they are made in their restaurant in Vietnam, which also operates under the same name “Hue Ky Mi Gia.” “We cook according to tradition,” Tiu says with pride. I love the fact that they use garlic chives to heighten the broth; the pungent mellow broth left behind a delicious sweet and sophisticated aroma. I love the use of fried garlic, crunchy pork rind, garlic chives and freshly sliced green onions and lettuce in the soup. The noodles come in two versions, soup style or dry style. I always end up choosing the dry style with the broth on the side. My favorite noodle dish here is Egg Noodle Dry Style (pictured above). It reminds me so much of my hometown cookery of Mee Hang. 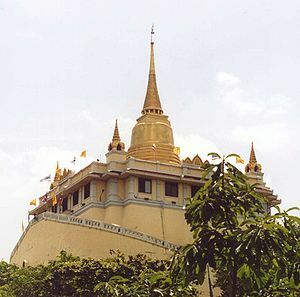 Tiu said a family ancestor was originally from China and found a new home in Vietnam. Her family is Vietnamese but the restaurant features mainly Chinese noodle soups, recipes that have been passed on in families for generations. Perhaps now I could make a connection; Chinese descendants my hometown also came from the same part of China. When I eat her egg noodle dry style it feels like being in Phuket. Most of all, I am thankful to her for preserving the authenticity of the dish. Without hesitation, I recommend Hue Ky Mi Gia to you highly. I judge the noodle restaurant by the broth and the noodle quality, and the rest is all about the authenticity. The price is very reasonable and the service is warm from this family owned business. I recommend going to the restaurant before the lunch crowd. The setting is casual, so don’t worry if occasionally there are slurping sounds accompanying the meal.